There will be chase to the set as well. 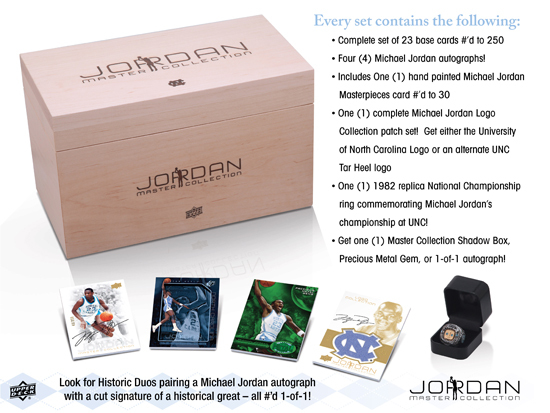 Randomly inserted into each collectible wooden box that hold these limited collectibles fans will find either a Master Collection Shadow Box card, a Precious Metal Gems card or a one-of-one autograph card of Michael Jordan. 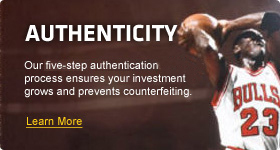 Additionally, some devout fans will likely chase the autographed “Letterman” cards that spell out “1982 National Champions,” “Michael Jordan,” and “Tar Heels.” Ultra rare “Historic Duos” cards can also be found that include an autograph from Jordan and another historical great. Keeping in line with the premium nature of these sets, all autograph content will appear live in the product and there will be zero redemption cards in these sets. It was fitting Upper Deck shared news on this set as March Madness kicks into full swing today and passionate basketball fans will be treated to memories they want to collect. This special set commemorates one of the greatest legends of all-time playing for one of the most storied basketball programs in history. Don’t miss your opportunity to own this historic collectible when the set releases this summer.